recently, we had two of our very good friends over for dinner. we love entertaining, and we find it to be easy, but it can be a tad stressful when you don't have time to plan. we found out that they were coming over for dinner only 2 hours ahead of time, so we had to move quickly. we must have looked like cartoon characters running around in a whirlwind trying to straighten the dinning room chairs, set the table, fold the napkins, fluff the couch pillows, restock the toilet paper in the bathroom, hide the dirty laundry buckets, clean the cat's litter pan . . . this is real life. since i had fresh chicken breasts in the refrigerator, i decided to make chicken parmesan. easy peasy. i picked a simple side dish, and i was good to go . . . that is, all except for dessert. you see, we love to cook and to bake with all of the things that make recipes delicious: butter, eggs, flour, the list goes on and on. except, one of our friends has a gluten intolerance (and i can assure you that there is no gluten-free flour in our house). so, i decided to make a cookie that didn't require flour. yup, these cookies are gluten free! 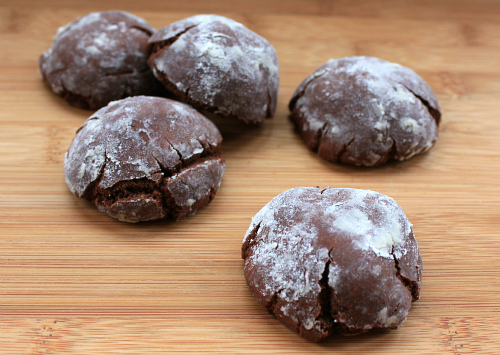 chocolate fudge cookies dunked in powdered sugar . . . how can you go wrong? when you eat these cookies, you will be so distracted by their chocolaty centers that you won't even notice the fact that there is no flour in them. high five! not only are these cookies quick and easy to whip up when you find out that you have company coming over, but they are so good too. your gluten-free friends will be so impressed with you and your gluten-free cookies! i guarantee it. preheat your oven to 350 degrees F. in a glass bowl, melt 1 cup of the chocolate chips in the microwave. microwave the chocolate chips in increments of 30 seconds until they are completely melted. stir every 30 seconds until smooth. once melted, set aside. in the bowl of an electric mixer, beat the egg whites on high until soft peaks form. gradually add in 1 cup of powdered sugar. beat well. mix in the remaining 1 cup of powdered sugar, along with the cocoa and the cornstarch. add the melted chocolate and beat until it is completely incorporated. the dough will be stiff. stir in the remaining 1/2 cup of the chocolate chips. roll balls of dough (approximately 1 tablespoon in size) between your hands until they are round. then, gently roll the balls of dough in additional powdered sugar until they are evenly coated. placed the coated dough balls on a cookie sheet lined with parchment paper. bake for 10 minutes, until puffed and the tops crack. once baked, allow the cookies to cool on the cookie sheet for 5-10 minutes before transferring them to a wire rack to finish cooling. You were reading my mind again! I have been really wanting to make our chocolate Italian cookie recipe.